By Bernard O’Neill: Vasyl Lomachenko, the 21-year-old world and Olympic featherweight champion from Ukraine, has kept the rest of the field at arm’s length in the latest AIBA World Rankings, updated following the recent AIBA World Championships in Milan. 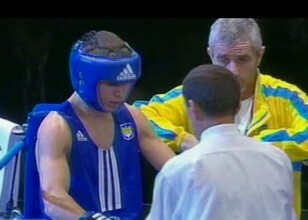 Lomachenko, winner of the Val Barker Trophy for best boxer at the 2008 Olympics, tops the 57kg category with a whopping 4,100 points, nearly 2,000 clear of the rest of his division. Italy’s super-heavyweight Roberto Cammarelle, like Lomachenko a world and Olympic champion, has the next highest overall points tally with 3,700, while 64kg leader Roniel Iglesias of Cuba, a winner in Milan and a bronze medalist at the Beijing Olympics, has 3,550 points. The new heavyweight world champion, 25-year-old Yegor Mekhontsev from Russia, made the biggest improvement in the rankings, climbing from 17th to 3rd in the 91kg division. Mekhontsev is behind second-placed Clemente Russo, the 2007 world champion from Italy, and clear leader Osmai Acosta of Cuba, both of whom Mekhontsev beat in Milan on his way to gold. Olympic silver medalist Purevdorj Serdamba of Mongolia collected 1200 points and moved up from 12th to 2nd at 48kg after winning Mongolia’s first-ever gold medal at the AIBA World Championships. The decision by his coach, Bandi Damdinjav, for Serdamba to drop down to his old weight following an unsuccessful Asian Championships seems to have paid off. The 23-year-old reigning world and Asian 75kg champion, Abbos Atoev of Uzbekistan, also dropped down a weight category, to middleweight from light-heavyweight, and won in Milan to move up to 3rd place in the AIBA World Rankings. Also among the top-ranked boxers are new world champions such as McWilliams Arroyo (51kg) of Puerto Rico, Detelin Dalakliev (54kg) of Bulgaria, Italy’s Domenico Valentino (60kg), the German Jack Robert Culcay-Keth (69kg) and Russia’s Artur Beterbiev (81kg). AIBA, the International Boxing Association, launched the official World Rankings for the first time in August 2009, the new lists helping to determine seedings which were also used for the first time at the AIBA World Championships. The lists are compiled according to the number of points won by boxers at ranking events, namely the Olympic Games, the World Championships, the Youth World Championships, the Olympic Qualifiers and each of the Confederation Championships. More points are won for performances at the Olympics and the World Championships.